Possibly the most absurdly over the top photo I have ever taken of a watch. But very cool, indeed. Great colors and contrasts...the eye is drawn many places, all of which are gratifying! Very nice photo, reminiscence of a sunrise or a sunset. Great shot Hank. The lume on a 50 Years of Diastar is quite surprising and I love how you managed to capture that despite everything being so well lit. That's a cracker Henry, nicely done. Must be around F 1.2, fairly low light though, did you hack the second hand or was it still fast enough to freeze it. Come on, out with the details for the shutterbugs. Scott, the lume on the 50 Years is quite surprising. I expected it to be more like the 40 Years of, but it is closer to the lume on the Diastar 40. Honestly, it's better than the lume on my XL 100M. For pictures where I want to show the lume on the 50 Years in the day, I set up the shot, make sure the watch is fully charged and shoot away. Turning the dial away from the light source helps the lume show. 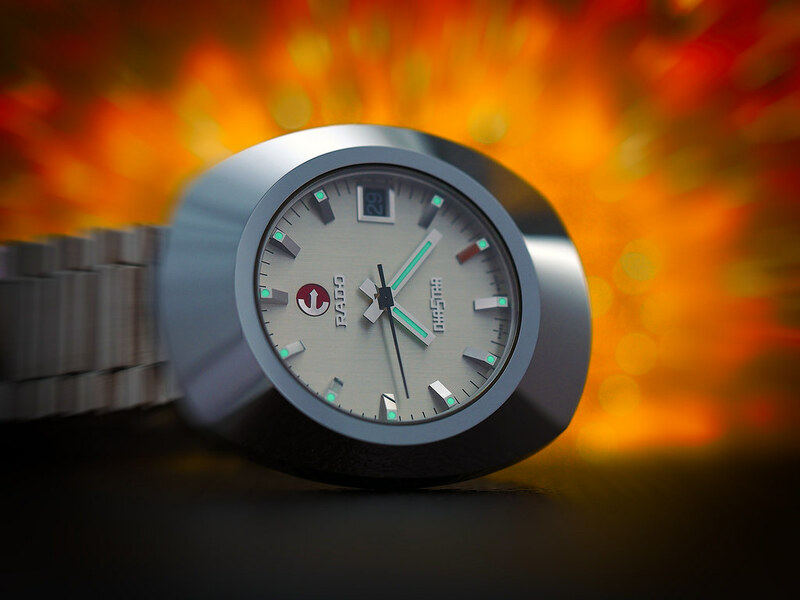 In this case I made a radial blur with a feathered mask around the dial. This is why the bokeh is shaped like gel caplets. finally I applied a vignette, though I have been experimenting with making physical vignettes for the camera. Ah, I was wondering how you achieved that zero depth of field effect. As you said, "absurdly over the top", in both method and most importantly, result. The depth of field was pretty shallow to start with. I am mildly obsessed with minimum depth of field right now. The drop out on the dial is 100% real. Everything out of focus was out of focus to some extent, but I added more beyond the dial as well as a fair bit of distortion. Photography was something I once had an obsession for myself Henry. I still have some very good Nikor lenses and an old FA film body. I have a nikon macro focussing bellows I used with my standard lenses for this sort of thing, not as skilfully as you I hasten to add, but I enjoyed it at the time. Alas, only the more expensive professional Nikon D bodies are still compatible with these older lenses......maybe one day........might have to forego a few watches eh? Henry your photography skills are of course legendary. I have absolutely no photography knowledge at all and reading through the posts am bewildered by all the technical language. I feel perhaps that i should start to learn a bit about photography as well as Rado watches and Dive watches ...this Forum should come with a disclaimer on the sign-up page! Looks like the Diastar is reaching lightspeed in that very moment...funny! I love that description. Which reminds me--what is your avatar? An album cover comes to mind...something Prog...Pink Floyd? Moody Blues? Last edited by Watch Carefully; 12-02-2017, 10:19 AM.